Our outdoor TVs are designed to exacting standards for maximum enjoyment in your backyard. 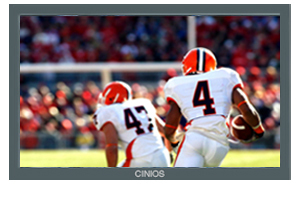 The weather protected design of CINIOS Backyard TVs lets you snuggle up to your favorite romantic comedy under the stars, get into the big game with friends, or play a video game with the kids, all in the comfort of your own backyard. Our WeatherProtect System eliminates the fear of damage from spraying water, rain, humidity, dirt and dust, or exposure to the sun... which can cause severe damage to a TV designed only for indoor use. Protection from the elements gives you peace of mind while the brilliant picture can stand up to full daylight conditions. All this in a sleek & slim design that will be the envy of the neighborhood. Don't worry about dropping the remote in the pool or spa…or maybe you left it out in the rain…no problem. The CINIOS waterproof remote can get wet without any damage…unlike a typical indoor remote, it is completely sealed and protected. And it floats too!! From using LED panels to reduce power consumption, to the outdoor decor-matching Anthracite Gray color, to the longer AC power cord, a Backyard TV from CINIOS is made for the Backyard environment. Throw in the impact resistant front safety glass, and side touch controls with the storable waterproof remote control, and you have easy worry-free outdoor TV viewing enjoyment! To insure that your TV does not suffer damage from spraying water, rain, humidity, heat/cold, dust and dirt entering the housing our Hurricane televisions are sealed and designed to keep water and moisture at bay. Even the speakers are waterproof. Our ventilation system keeps the unit cooled when necessary, and condensation free. In a Rainstorm -- It's That Protected!